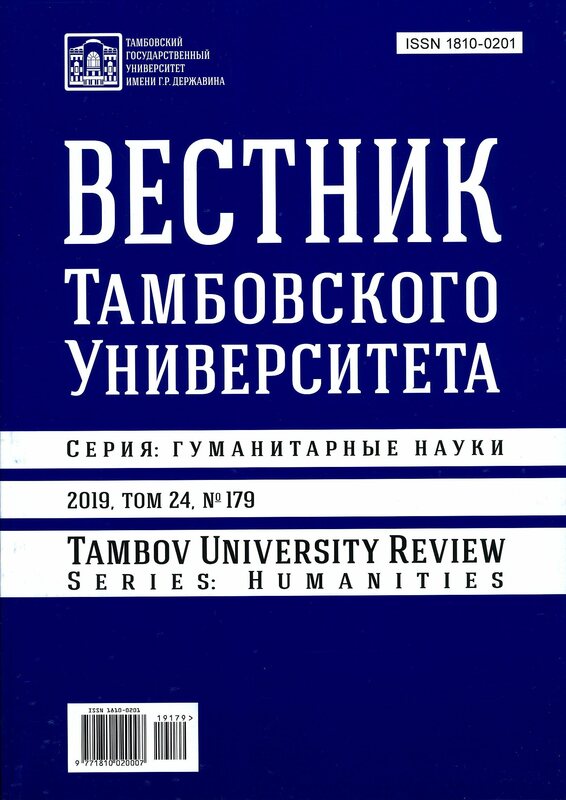 Journal “Tambov University Review. Series Humanities” is scholarly and applied journal of broad profile. It is published since May, 1996. The establisher, publisher, is editorial of the journal – FSBEI HE “Tambov State University named after G.R. Derzhavin”. The journal is registered by the Federal service for supervision of communications, information technologies (Roskomnadzor). The certificate about registration of mass media ПИ № ФС77-70574 from 3 August 2017. Indexed by CrossRef. DOI: 10.20310/1810-0201. 6 issues come out in a year. Journal is added in the catalogue of agency JSC “Rospechat”. Subscription index 83371. Distribution territory of the journal: Russian Federation and foreign countries. The journal is distributed at conferences, exibitions, in the editorial office and partner universities. The journal publishes the articles having the scientific and practical value for academic society: original articles, reviews, personalia, information about scientific forums. The preference is given to the scientific articles containing new results of the theoretical and applied researches within the journal’s headings. The editorial welcomes the reviews containing the analysis of the modern foreign publications allowing assess the condition of the considered topic. All the articles received by the editorial must be reviewed; the manuscripts are not given back. Publications in journal are made on non-commercial basis. You can get acquainted with the requirements for execution in the section “Rules for the authors”. The authors of the journal are the scientists from various Russian scientific and educational organizations and also from countries of Commonwealth of Independent States, near and far abroad. The publication is for scientific workers, lecturers of high school, doctoral candidates, post-graduate students, master’s degree students, students and all who are interested in achievements of modern Russian science, including international community. Languages used for publication: Russian, English. The journal indexed by ERIH PLUS (European Reference Index for the Humanities and Social Sciences), and is included in the International database of Scientific Literature SciLIT. The journal is included in the one of the biggest international bibliographic databases "Ulrich's Periodicals Directory" of American Publisher Bowker. It provides information about serial (periodical and continued) published issues (popular and academic journals) on all thematic directions of life's activity. Policy of the journal. The aims of the journal are recognition of scientific achievements in the modern humanitarian knowledge sphere, distribution of the scientific research results within the modern humanitarian knowledge. The main task of the journal is the scientific researches results publication, conducted within the leading scientific schools and directions of Tambov State University named after G.R. Derzhavin. The editorial may disagree with the point of view of the authors. The responsibility for the contents rests upon the author. The reference is obligatory while using the materials of the journal.